Quality sound is paramount for any music system or media room. When building or renovating, there are options for great sound without sacrificing your home’s style and aesthetics. In-wall & in-ceiling speakers, invisible speakers and hiding traditional speakers are great ways to minimize speaker visibility in a room. They’re great solutions to make everyone from designers to audiophiles happy. 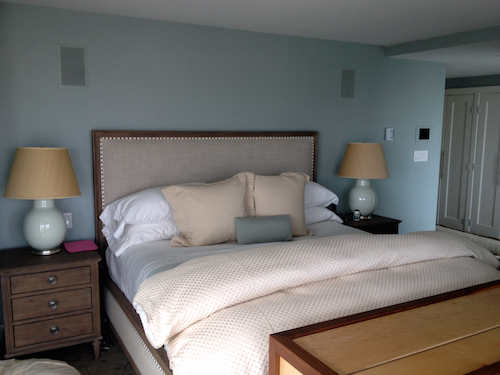 A simple and affordable option is to use in-wall or in-ceiling architectural speakers. 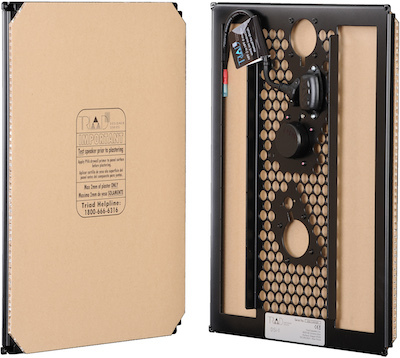 Speaker companies like Focal offer options from excellent, low-cost to high-end, audiophile grade architectural speakers. As a guideline, ceiling speakers are great for ambient music and in-wall are for more dedicated music listening or demanding home theatre applications. That said, either installation type can be tweaked to sound great to work around aesthetic or building issues like concrete ceilings in a condo. There are also built in subwoofers available from companies like Triad, so you can even get rid of those big boxes too. Invisible speakers are similar to in-wall and in-ceiling speakers, but they are actually designed to be part of the wall. After installation, they are plastered and sanded to be part of the wall surface. They can be painted or wallpapered over to completely disappear. Invisible speakers come at a premium price and are not for all situations. They are better for smaller rooms, and care must be taken to not place where a nail could be hammered in (for say a hanging a picture – they are invisible after all!). They provide good sound quality, but have wider dispersion than other speaker types. If you have the right room and want ambient music, then these could work for you. Another option is to hide away traditional ‘box’ speakers behind sound transparent material. A common version of this is placing home theatre speakers behind a sound transparent projection screen. This can be more involved, as you will need a false wall to house the speakers. It turns out to be pretty slick though as the movie sound comes from the screen like in a commercial movie theatre. With a bit of creativity and planning, you can have your excellent sound system and clean aesthetics in your living space. There are affordable options that can provide minimal visual impact for most rooms and situations. If you have audiophile tastes or demanding aesthetics to meet, there are also higher end products. Yes, you can have great sound and a great looking home too. currently has four options: Switch, Switch+Motion, Motion and Baby. We’d started with the WeMo Switch as it can be used to replace those cumbersome mechanical timers, plus you can use your smartphone to turn stuff on and off at a whim. They are easy to setup and use. If you have or are about to have a baby, the WeMo Baby monitor is definitely worth checking out as well. 2) Wireless music systems – For Vancouverites with iPhones, iPads or Macs, we’re huge fans of Apple’s AirPlay products to distribute music and media wirelessly around the home. Other manufacturers are also supporting the AirPlay standard including Bowers & Wilkins, Altec Lansing and Denon – some real quality choices available. Sonos also has excellent music systems. Simpleer can help make sense of this for you and your home to get you rocking out (or chilling when required) at the touch of a button. 3) Network Cameras – The quality of network cameras is going up and the price is coming down. For cameras to keep an eye on your baby at nap time, your vacation home or even your pets antics while your out, companies like D-Link and Linksys have some great options. If you’re looking for a convenient method to check and talk with who’s at the front door regardless of whether you’re home or not, the DoorBot Doorbell with build in network camera may fit your bill. 5) Phone Finder Apps – It seems like every Vancouverite has a smartphone and tablet. But what happens when they go missing? Have no worries, as Apple has Find iPhone and there is Find My Phone for Android. Apple’s app is compatible with iPhone, iPads, iPods and even MacBooks. You can make it play a loud ring to find your device or to erase it if you think its stolen. Find My Phone covers your Android devices. These apps are very handy to keep a tab on your loved ones too if they are open to that. These apps are very powerful for elder care to help guard their independence, while still offering support when needed. Just remember to install the app and set it up now before you need it later! 6) Car2Go – The need for owning multiple cars or any car at all is shrinking in Vancouver. With most homes here, parking is also getting tight. There are times when you just need a car for a quick trip though. This is where car shares and micro rentals are handy and affordable. One or our favourites is Car2Go. They have cool Smart cars and smartphone apps to help you find the cars parked around the city. You need to sign up for a membership, but after that its scan your card, go, and park it – you only pay for the time when you’re actually using the car.